I have been developing a lightweight, multi-band, dipole antenna for backpacking. Although most vista or overlook locations along the AT have no trees that could effectively accommodate a dipole (which is why I have built the N2XE multi-band vertical), I have designed a simple, connect-and-play dipole for 20m, and 40m. So this past Saturday (10/29) was the target for hiking into Catfish Fire Tower on the AT ( link to web pages) to test the dipole strung off the Fire Tower. A secondary goal was to camp overnight at the site and have some QRP fun on 40m after dark. I arrived at the Tower about noon after a 2 mile hike in with my 45-lb pack. The weather was mostly cloudy, winds out of the NW at 15 to 20 mph with higher gusts. The temperature was in the low 40’s, making for a chilly day at the relatively exposed Tower location. What I didn’t expect was the numerous “tour groups” of 10 to 15 people who were guided in to “view the fall colors.” Apparently this is a common “activity” for this time of the year. 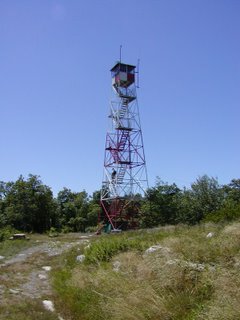 Even the Forest Service was on site provided tours into the “cabin” of the fire tower. Now the steel-structured Catfish Tower is 65’ tall and was noticeably swaying due to the gusty winds. Only a handful of folks were braving the winds and climbing the stairways to the top. I met Bob Wolf, the local Forest Ranger, who was very intrigued with what I was doing and more than accommodating. We spent about 40 minutes talking about Morse Code, the changes in the industry, and radio communications in general. When I tied one end of the dipole at the 65’ level on the Tower, he invited me into the “cabin” of the Tower and we talked another 20 minutes or so. I threw a rock over a tree limb for the other end of the dipole, pulled everything taunt, connected the K1 and tuned in a loud CW station to let everyone nearby hear “ham radio.” I spent the next 45 minutes in a “show-and-tell” mode for curiosity seekers. At the same time I setup my Sierra Design 3-season backpack tent so I could get out of the wind and cold temperatures. The tour groups left about 3 pm and I spent most of the next three hours on 20m with about 10 contacts around the east coast. The dipole with one end at 60’ and the other at 40’ played really well, especially since this site has a HAAT of about 450’ or so and sharp drop offs to the east and west. So the K1 was humming along. My plan was to switch to 40m near sundown. I let the dipole down, connected the jumper over to the 40m segments, raised the dipole up again, crawled into the tent, quickly changed bands on the K1 only to get a blast of European SSB stations! I forgot! This is the CQWW SSB weekend and ITU Region 1 and 3 allow SSB down to 7.000! Needless to say, the QRM was miserable and only a few QRO CW stations were on. My 5-watts wasn’t getting anywhere. Now the temps were in the low 30’s, the wind gusts still as strong, and the 40m band a mess. I’m not going to have any fun here. And I was in my 3-season lightweight tent....the wind was buffeting the "house" terribly. Time to reconsider. So about 8:30 pm I packed everything up, disassembled the antenna system, put my LED headlamp on and started the hike out. Fortunately the clouds had given away to a beautiful clear sky. Mars and Venus were both very bright in the sky and the stars were magnificent. The view of the night sky alone was almost worth the trip. Now I need to add the 30m segment to the dipole for times precisely like this!